While Day 1 was pretty incredible … it was really all about Day 2 – Saturday. And it was really all about just 3 bands. We showed up late into the day and strolled into the park right as Spiritualized was taking the stage in the Arena. The Arena couldn’t have been a more perfect place for the band to perform. The show was pretty sparse which was a bit of a surprise with a near empty floor. We opted for the seats up above and werent too far away with amazing views. The band was swathed in lights and it made for one of the best light shows of the festival. “Lord Let It Rain On Me” sounded just beautiful – with loud, fuzzy guitars and the women vocalists in the backdrop. 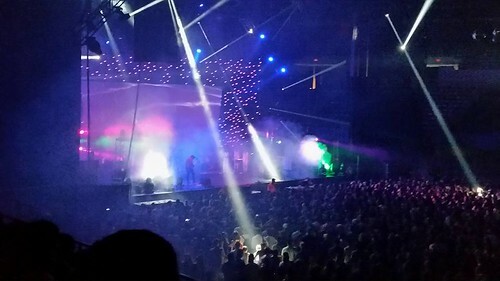 Jason Pierce’s vocals were just beautiful as they echoed through the arena and filled the room. And then it just melted into “Electricity“. Its hard to have even imagined a more perfect set than what the band gave to us. Throw in some heavy, droning guitars and turn it up and one hell of a laser light show and its pure electricity. Jason’s vocals were haunting through the loud guitars and filled the air. The crowd below swayed with a few people jumping around. It was just an electric, raw feeling that I knew I wouldn’t get from any other band. And soon after, the very space-y jam “Electric Mainline” that you can just close your eyes and feel like youre in the music – it just takes you away as the guitars drone on and on and your body just moves with it. Such a beautiful feeling. And naturally, as this song came on the joints started getting passed back and forth behind me and the arena started looking like it was one big cloud of smoke. The show just got better and better with “She Kissed Me (It Felt Like A Hit)“, “Oh Baby” (which really emphasized the background singers – who of course sounded amazing!) and eventually coming to the end with the Spacemen 3 cover “Walkin’ With Jesus” which always makes me feel like I’m in a church with such powerful lyrics. Spiritualized ended the set with “Come Together” which couldn’t have been a more perfect ending to the set. That song just takes you away — your body moves to the music – heads swaying/bobbing back and forth — and then the loud guitars come in and BAM! It’s pure heaven! And they were just awesome! And then came a bit of a wait – as I checked out some bands. Battles sounded awesome and are so worth seeing again. The 3-some from NYC and their experimental art-electronic rock sound were a really great time. “FF Bada” is pure catchiness, if not a totally out there song but it had the crowd moving and snapping along. And then of course, there’s “Ice Cream” which is so hard to go wrong with. Its pure catchy, love, hip shaking, infinite loops that are always changing and dance around fun! What’s not to love about this band! Following Battles, was LA’s Health. The loud, VERY loud rock/experimental band, could be heard from nearly everywhere. I had seen them before and just loved them, but this time just couldn’t get into them. It just seemed like screamo rock without much else, but perhaps it’s just their new album or just not a great set up. Either way, sadly, I didn’t stay to hear much of them. Did attempt to see Solange as I had heard great things about her, but after not starting within 15 minutes of her start time, I ended up taking off. Not sure what time she eventually came on. But I had places to be … as in needed to get past the famed 1984 Olympic site with the lovely olympic rings to see hear some ‘Stars of Track and Field’ aka Belle & Sebastian. And finally, we were getting to the best of the best. Scottish band Belle & Sebastian were clearly up for a good time. They had recruited members of the audience to be part of the show and they just danced on the sidelines for the most part; although one girl, who apparently thought she was the show, seemed to end up in Stuart’s lap quite a bit. While it was a bit distracting, it really didn’t seem to matter all that much. Belle & Sebastian opened with “Nobody’s Empire” off their newest album Girls in Peacetime Want to Dance. Its fun and catchy and a great way to start the set. Singer Stuart Murdoch seemed in great spirits and just wanting to have fun. It was awesome that there were so many people on stage as well as so many instruments. And if you wanted to dance, the set could’t have been more perfect. They jumped right into “Im A Cuckoo” and everyone was dancing and bouncing around. Pure blissful fun indie-pop. It could only get better. Stuart asked the Angelenos (pronounced in a way only a Scotsmen could say) if we wanted to party on this Sunday night before going right into “The Party Line“. And just like that Stuart was dancing and on the screens there were people dancing with their great little dance moves. If that couldn’t get a crowd dancing than nothing would. Stuart was beyond chatty – talking between songs and adding a lot of banter. But of course the real highlight (even if all too predictable) was “The Stars of Track and Field“. He joked about how most of us weren’t alive during the olympics but he remembered watching it in 1984. And of course, with the olympic stadium behind us — it was hard to not be touched. Jokes about the jetpack man (where is he now?) 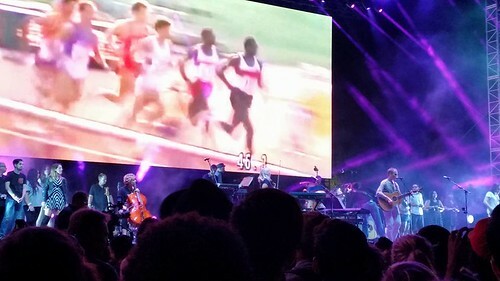 and of course Carl Lewis on the big screen as the band played on. It was just too awesome and how often (if ever) can you say you saw a band play the most perfect song at the most perfect place. Even if it ended here, I’d have been beyond happy. And clearly, the best had yet to come. 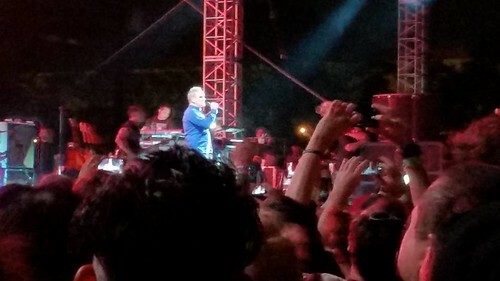 The crowd surged forward and everyone needed to get as close to Moz as humanly possible. At this point – I went to the side as I was not about to get crushed. Sadly, I had missed Moz in July in San Jose, so it was a long time coming (he manages to cancel all of his SF shows, so thankfully I saw him plenty in NYC)… And Morrissey did NOT disappoint. 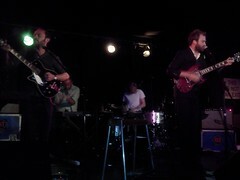 Coming out in jeans and a bright blue long sleeved shirt and the band sporting Crapitol Records, he was at his finest. He had the best images on the large screen behind him and with the Queen Mum flipping us off, Morrissey started the show with “The Queen is Dead“. He sounded as great as ever and starting with a Smiths song!!! I didn’t really care what happened after this, as at this moment it was pure happiness. The crowd went crazy as the next song was “Suedehead“. Seriously, how could it not be more perfect. Everyone started singing along and it was louder than Morrissey himself. I swear, if I hadn’t seen him before, I would have been crying with all the emotion I felt at this moment. I felt like I was back in highschool and seeing him all over again for the first time. He still works the stage better than any other performer I’ve seen. He plays to his fans and LA fans are serious about Morrissey. They love him like no other. (Next LA show, I am flying down). There was so much security protecting Moz, no one could really climb on stage so naturally Moz had to chastise them saying there were too many of them! Its a sick love/hate relationship with Moz and his security. Of course, it wouldn’t be a Morrissey show if he didn’t express his views and show it in the hard-cold reality. He had choice words about our police and all of the police brutality. With images on the screen of black men getting beaten up by police, its hard to be surprised by what he shows. He had choice words about Obama, American politics, British Royalty and of course, meat. He has probably become more in your face over the years, but its hard to not love him. He doesn’t hide from his views and is always confrontational. Good thing him and Kanye weren’t playing the same night. “World Peace is None of Your Business” sounded just great and it was also awesome to hear that he now sings a bit in Spanish and has clearly learned quite a bit of Spanish thanks to all of his time in LA. And then soon after even more Smiths. As soon as he started with the opener of “Stop Me If You Think You’ve Heard This One Before“, the crowd went crazy and everyone was singing and dancing along. It just got better and better. I can’t even begin to fathom how it was so perfect. “First of The Gang To Die” which is a perfect song to be playing in South Central. “Meat Is Murder” was just awesome to hear and its hard to imagine dancing along as he performed it with all the images of animals being slaughtered. It was so Morrissey and it was hard to not feel nauseous watching it all. Some guys around me joked about now getting a burger, but I just felt ill. Nothing like literally shoving this down our throats. Morrissey is one of the best crooners still performing and he knows what to play for his crowds. So, of course he played “Everyday is Like Sunday” and all I could hear was everyone singing around me … and of course, now there’s some Spanish thrown in and its fitting and was perfect. And this might have been the perfect song to end with. A perfect Sunday would come to an end, but this memory will live on forever. So many bands, so little time! It seems its the same thing year after year with CMJ. Ive got a complete schedule that ends up useless in the first 5 minutes. Bands either fail to deliver or theyre so great – I end up seeing other bands on the showcase I might have passed up. Unfortunately, there are also times when you’d rather just shoot yourself and call it a night when disappointments continue. The Duke Spirit – technically, they shouldnt even be included in this. Theyre established and damn good! Of course, they were the highlight of the night – and I fear if I continue to see them not much else will compare. Liela looking smokin’ hot as usual is always great fun to watch. She has so much energy when she performs and she commands the stage. Its hard to take your eyes off of her when she moves as she glances around the room. Her voice is perfection as she growls through the songs. Surprisingly, they played their older songs instead of playing newer songs. Perhaps it was due to a really tight schedule in which they were needing to be in Brooklyn. They played a way too short set of about 8 songs but it couldnt have sounded better. The dirty, muddy sounding guitars were a great complement to Liela’s voice. The garage rock psychedelic sounded great in the posh Bowery Hotel. It couldnt have been a greater set. Hands, from LA, took the stage prior to The Duke Spirit. They had a pretty big turn out with what seemed to be lots of friends (or maybe girlfriends) from Cali. They sounded incredible and much better than I could have expected. 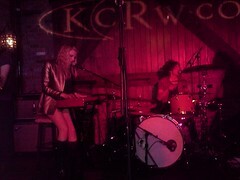 The backing of the psychedlic, lush sounding keyboards and guitars filled the air, with a similar sound to Sun Airway. The vocals are strong and it seemed like if Division Day (another LA band) had continued and made their songs a bit more dancey this is what youd get. The drummer, playing barefoot naturally, keeps the beats going. The keyboards nearly swallowing the lead singers voice on some songs works out beautifully. The music, the vocals and the guitars all blend so perfectly well together it gives such a complete sound. If youre not sure of who to see during CMJ, this band is definitely not to be missed. They have a show on Thurs afternoon at Pianos which should be great. or the actual songs they chose, but as their set continued the music definitely got better. They have some great melodies and their voices play off each other’s quite well. “The Northern Territory” which they ended with was easily one of their best songs and definitely more popular. A lot of people were singing along and its catchy and fun. It sounds so much better live, that its worth seeing them just to hear that song. Its a punchy, fun toe-tapping awesome song. “Black Cat John Brown” was also another highlight. The other band members broke out with other instruments during the song. It seems they’re all quite talented players going back and forth on instruments. They’ve got a free showcase on Thurs over at The Delancey with some other Dutch bands. If youre not doing much – its worth checking out. And the well — not so good and you might walk out on bands. Marcellus Hall – now if youre quite into country music, youd probably find the band quite good. They had a good sound and the lead singer was pretty amusing – so this alone made it better. As Im not a fan of country music – this was pretty painful and it seemed each song kept getting longer. Thankfully when soon there were only 3 songs, it became 2. And naturally, they’re all about love and relationships. The woman on violin did sound pretty awesome and it was her birthday – so cheers to that! 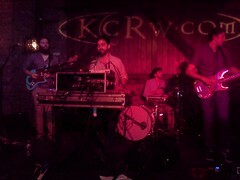 The Silent Comedy – which has such an awesome band name – so disappointed. I couldnt wait to get out of the show and it couldnt happen fast enough. Sounded like some sorta folky-bluegrass jangly type thing with banjos and all. Maybe they should have played after Marcellus Hall insteaad of spacing it out so oddly. Perhaps that was the original set- but with The Duke Spirit having to be in Brooklyn lots of things were changed. Either way – meant an early night. And oh New Zealand – I had such high hopes for you. Andrew Keoghan, who was oh so nice to look at, was a little underwhelming. The guitar and drum thing had so much potential, but it was more of just a singer-songwriter act. Not bad sounding all, just a bit boring. Princess Chelsea was interesting. The women had good voices and the way the band mixed it up on instruments was pretty cool. Their first song, which I knew from online, was very catchy, but then it just sounded like more of the same. It really seemed like 2 girls on their computers, mixing it up with sounds and beats and 2 guitars who added a bit more, with a drummer occasionally filling it in. Not a bad thing, just a bit slow and was near sleep inducing. Prob a great band to end a night with. Heres to Day/Night 2. Hoping for some great things!